The first inhabitants of the Virgin Islands were the Caribs, Ciboney, and Arawaks. In 1493, Christopher Columbus discovered the islands while searching for a route to India and called the people Indians during his second voyage to the New World. Columbus named the islands "The Virgins" after St. Ursula and her 11,000 virgins. Unfortunately, he and his crew brought diseases from Europe which eventually killed off the indigenous population. St. Thomas has been known for its shopping since the late 1600's. In 1672 the Danish West India Company established a settlement. In the early 1700's, St. Thomas was a pirate refuge for many notorious buccaneers, the most famous of which was Blackbeard (Edward Teach). By 1800 Charlotte Amalie was one of the busiest ports and trading centers in the Caribbean. Today, St. Thomas is one of the most popular ports of call among the cruise lines and a popular Virgin Island vacation destination. The United States bought the Virgin Islands from Denmark on March 31, 1917. The islands were sold to the U.S. for $25,000,000 in gold ($300 per acre) due to the fear of German expansionism and the need to fortify the defense of the United States during World War I. The island kept the Danish names of many streets and former plantations. Charlotte Amalie is named after a Danish Queen who was the wife of King Christian V. The shopping area on Main Street is known as Dronningens Gade, which in Danish means Queen Street, Kongens Gade is King Street, Kronprindsens Gade is Crown Prince Street and Kirke Strade is Church Alley. The island is approximately 32 square miles in size. St. Thomas is home to luxury resorts, hotels and fine restaurants and great shopping. Much of the island has Danish influence. Steep hillsides with bright red roof tops and lush with flowers make Charlotte Amalie a photographers paradise. Shopping is tax free and travelers are allowed $1200 in duty free purchases. St. Thomas is home to some of the most beautiful beaches in the world. Some of the beaches you won't want to miss include Bluebeard's Beach (formally known as Limetree Beach), Brewer's Beach, Coki Beach, Cowpet Bay, Hull Bay, Lindbergh Beach, Magens Bay, Morningstar Beach, Sapphire Beach, Scott's Beach, Secret Harbour, Stumpy Bay, and Vessup Bay. 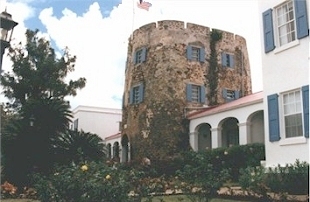 Fort Christian in downtown Charlotte Amalie houses a museum with a collection of Indian and Dutch artifacts and dates back to the 17th century. It has been used as a Fort, prison and court house. Across the street is the beautiful Legislature building where laws governing all the US Virgin Islands are made. The St. Thomas Synagogue built by Sephardic Jews in 1796, is the second oldest temple in the western hemisphere and the oldest continuous synagogue congregation in the United States. In 1804 the synagogue was destroyed by fire and was rebuilt in 1812. In 1823 the congregation grew so large that the temple was dismantled and a larger one was built in its place. In 1831 a fire that engulfed the city destroyed the temple again and a was rebuilt again in 1833. It has sand covered floors which was to keep the sounds of prayer and learning private when practicing Judaism was forbidden. It is also thought to be representative of the 40 years in the desert the Jews wandered when exiting Egypt. The synagogue's website can be found at http://www.onepaper.com/synagogue.There are also many churches covering all denominations. You will see many murals along the walls lining many of the streets depicting religious values. Many cars have sayings praising god. Located in the Atlantic Standard Time, daylight savings time is not recognized. The Virgin Island climate is tropical with wonderful average winter daytime temperatures of 78 degrees F. and summer daytime temperatures of about 82 degrees F. January through April has less humidity and fewer showers. May through November has higher temperatures and risk of a hurricane.